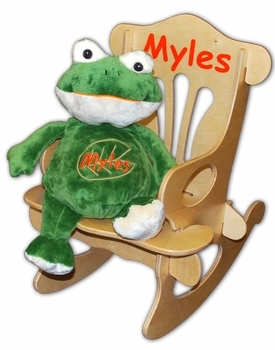 Sitting at 16 inches, this personalized green frog arrives with a special baby boy's name embroidered on his belly! He is oh-so-squeezable and is paired with a deluxe child’s wooden rocking chair, made from durable 3/8 inch Baltic birch. Please click on More Images to see a photo of the new plush frog and a close up of the detailed embroidery. The rocker is carefully engraved and then hand painted with baby’s name on the back rest creating a beautiful and lasting childhood keepsake! It is then finished with a child-safe gloss finish. This item is also perfect for a birthday gift or for an older sibling. Please note, the chair will arrive un-assembled. It is easily put together without tools or any additional hardware required making it an ideal chair to use when traveling! Allow approximately 2 weeks for personalization to be completed.